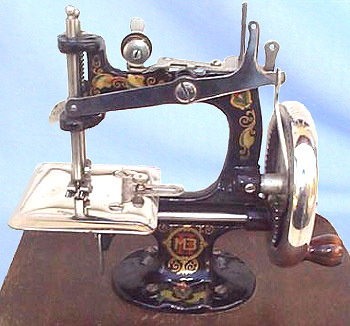 toy sewing machine - Russian toy (Singer 20 lookalike). This attractively decorated 20th century Singer 20 type was produced in Russia. It has been suggested that the ornamental logo's literal translation is "Pensa Machine Factory", and made in Kasachstan. However, new information from a Russian contact suggests that the machine was made by the Podolsk Mechanical Factory, Podolsk being in the Moscow region.